Rhubarb fool, rhubarb ice cream, rhubarb crumble – been there, done that, bought the t-shirt. I wanted to use rhubarb in a savoury recipe in a sweet and sour combination that would cut through and complement something rich, in same way you make a gooseberry sauce to go with mackerel. 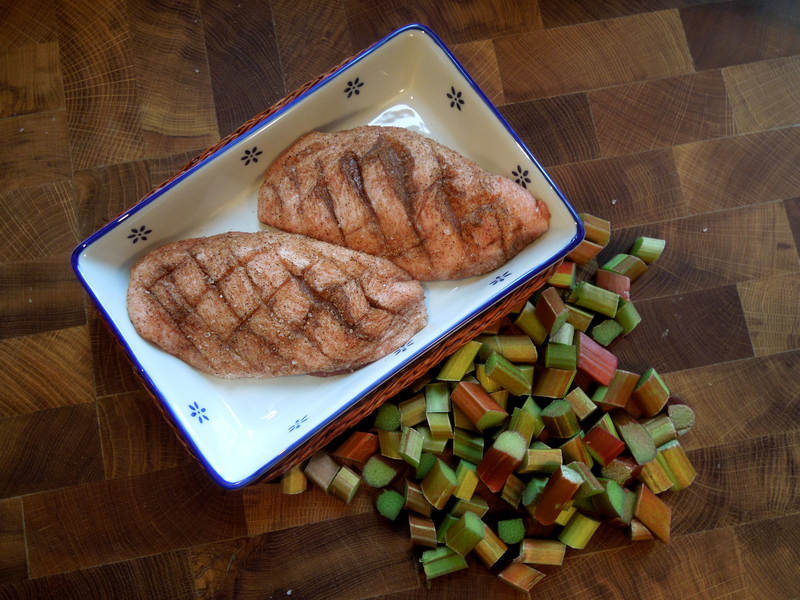 So pairing the rhubarb with duck breasts and Chinese spices seemed like the way to go. This is a good dish for a weekend supper; quick and easy to make but with flavours that lift it out of the ordinary. It’s based on a recipe from Michel Roux Jr.
To make the purée, put the sliced rhubarb into a pan with the sugar, star anise and ginger and a tiny splash of water. Clamp on a lid and cook gently until the rhubarb starts to break down, then stir until it forms a purée. Reduce on a gentle heat until you have a thick sauce and set aside to let the flavours infuse. You can make this in advance and reheat it later, if you like. Pat the duck breasts dry on kitchen towel and score the fat without cutting through to the meat. Mix the salt and five spice powder together and rub all over the duck, getting it well into the slashes on the fat. Put the duck breasts skin-side down into a cold frying pan (you don’t need to add oil) and cook on a medium heat for 6-8 minutes until golden brown, pouring off the fat regularly. Seal the other side for 30 seconds. Now put them skin-side up on a rack in a roasting tin and cook in the oven for 10 minutes if you like them rare, 15 minutes for medium. If you like your duck well done you’re reading the wrong blog. Oh, alright, 18 minutes. Remove from the oven and allow to rest somewhere warm for 10 minutes. Bear in mind they’ll continue to cook in their own heat while they’re resting. For the garnish, heat the butter and sugar in a heavy-based frying pan and stir until the sugar has melted. Add the rhubarb batons and cook gently for a few minutes until just tender to the tip of a knife but still holding their shape. Warm the rhubarb puree gently, discarding the star anise. Slice the duck breasts. Put a spoonful or two of purée on each plate and place the duck on top. Garnish with the rhubarb batons. Try it, as we did, with plain boiled rice and a quick stir-fry of garden vegetables, cooked in shallot and chilli oil (or add a smidgen of fresh chilli) and finished with a splash of soy sauce. 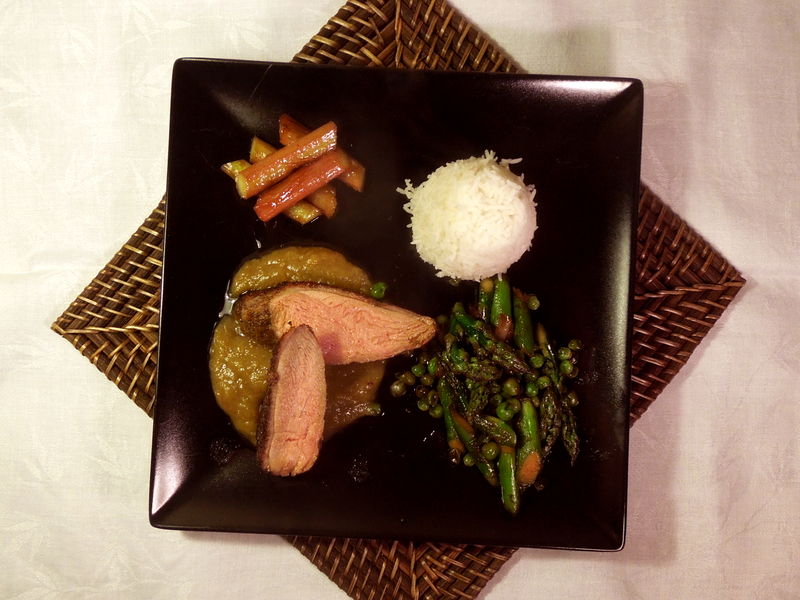 This entry was posted in Chicken and other poultry, Mains and tagged duck breasts, savoury rhubarb recipe, spiced duck with rhubarb by Linda Duffin. Bookmark the permalink. Love the rhubarb. An inspired choice with duck. Eldest’s boyfriend is threatening me with some plums from an overhanging tree in their garden. I will do something similar when they ripen/fall/are stolen/arrive in the house. Thank you, Conor. 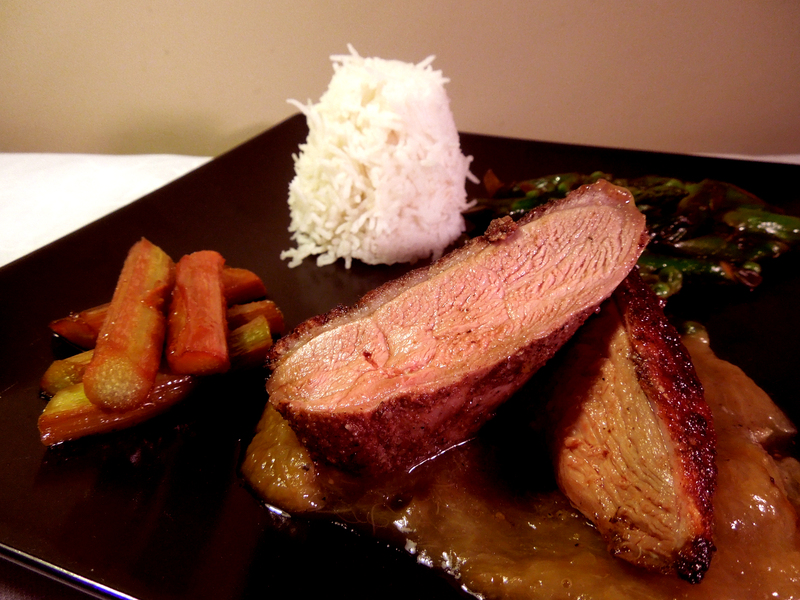 Love the idea of spiced plums with duck, too. I’m hoping we’ll get a decent crop from our fledgling orchard this year.